Fried Rice Recipe many kinds of its kind and can be varied according to taste, will be more special if added with sliced eggs or sausage and others. The menu this one sometimes a menu mainstay sector in a restaurant or cafe with excess and characterizes the fried rice dishes of the meal home. Differences fried rice with ordinary Java is located in a variety of herbs and spices that make the food extra looks to be very wow really. Since this is the first article complete recipes will try to share how to cook fried rice but with a special easy process does not not take long. Just passing of a plate of rice if made with solid preparations can be very charming. Furthermore if if you are adept at cooking the rice sometimes can be a wide variety of other processed. 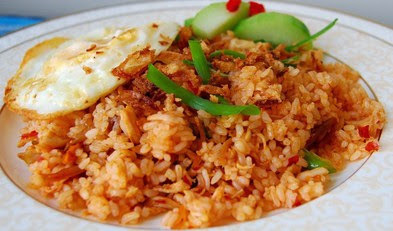 Indonesia itself has been known for fried rice dishes are popular among outsiders. Add the eggs, then scrambled eggs. Enter the white rice mix well with all of the above.